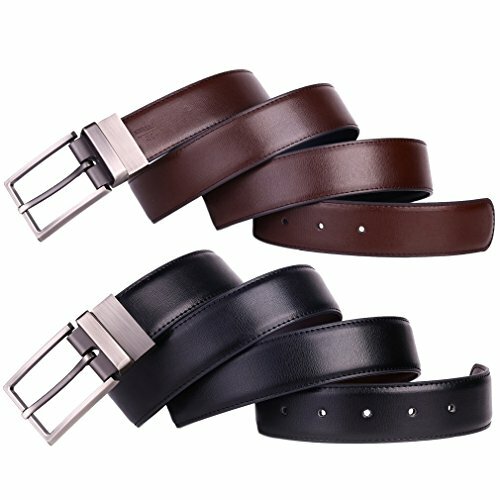 Beltox Fine men's reversible leather formal belt with rotated buckle size from 30" to 48" is a smooth genuine leather belt. The belt is reversible from black to brown to meet your dress pants occassions. The buckle is rotated. That means one size belt is black and when you rotate the buckle to the other side, the belt become brown. It is amazing. Easy and simple to change the belt color. The buckle is removable, you can remove it and replace it with your own. It is a classic belt for men and you can alwasy wear it. All successful men would like to be dressed with a high-grade sturdy belt like this one and never to be old fashioned. Good luck to you. The buckle is rotated with a little strength when stretched. So the buckle match the belt well. Two in one belt. Classic and dress belts. Environmental protection materials for the belt and buckle. Genuine leather belt and alloy buckle. The buckle is removable, you can replace it with your own. Versatile usage. If you have any questions about this product by beltox fine, contact us by completing and submitting the form below. If you are looking for a specif part number, please include it with your message.